One can naturally envision Audrey Hepburn and Grace Kelly applying lipstick in this powder bathroom. 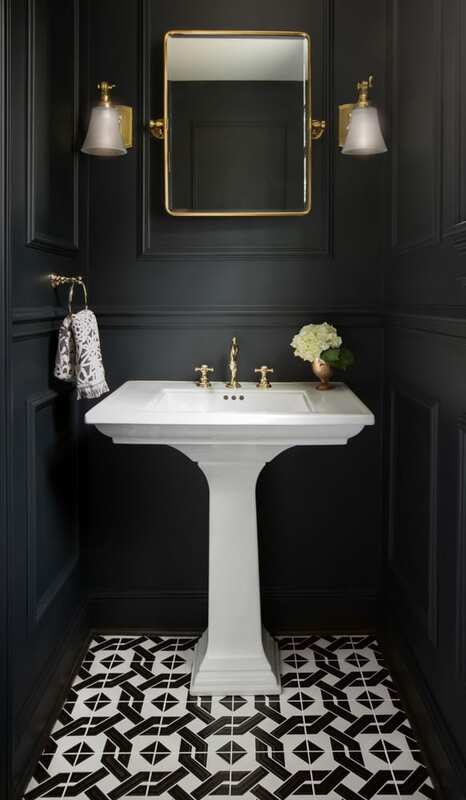 This small but mighty bathroom feels bold, fresh and perfectly dramatic. The floor tile laid the groundwork for the space and was a selection risk for the homeowners. When you see just 1 or 2 of the Alyse Edwards tiles you don’t get a sense for the big picture pattern as they are a graphic design that weave together. The tile is black and white with a raised black dimensional design in a matte and gloss black color. Graphic and bold, it reflects the stylish times of the art deco days. The brushed brass fixtures were chosen next. Their color is luxe and soft; the perfect color between gold and brass. The homeowner feared that left by herself to make decisions they would be too safe, as she always veered toward choosing things that were mainstream like grays and marbles. Her goal for this bathroom was that it was special and different. She needed help to be pushed outside of her comfort zone. The major push in this space was the all black paint color. It sounded crazy. Where to start and where to stop? Should you paint the door black too? And the window? Even the base molding and crown molding? Would it be too dark? Would the character get lost in the all black? Rebekah nudged her to go bold and paint it all. She encouraged adding a wainscot wall treatment design. She assured her that the wainscot wood treatment would add the depth and dimension, especially as it would be applied from floor to ceiling. It sure worked out perfectly – everything looks glorious and glamorous. This stunning powder bathroom is now the homeowner’s favorite room in the house. She loves it because it is timeless yet fashion forward, classic yet bold.